Last November, I wrote about why the leaves of deciduous trees drop in the fall. Now as I survey the trees in our woods and around the yard, I am reminded that a few deciduous trees hang on to some or all of their leaves through the winter. Our little Japanese maple and many of the oaks in our woods still retain a lot of their dried up brown leaves. In Vermont, I notice this with the beech trees that are scattered through the woods at my mom’s. This got me thinking about why these trees, oaks and beeches in particular, keep their leaves through the winter. 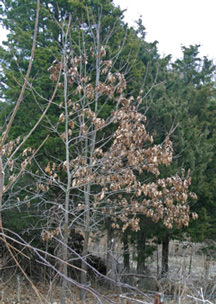 Marcescence is the term used to describe the retention of dead leaves on deciduous trees through the winter. Certain tree species show this characteristic more commonly; oaks, beeches, hornbeam, and witch hazel. Why do these trees hold onto their leaves? of their leaves through winter. The answer is – no one really knows for sure. There has been much speculation and several theories have been put forth but still nothing has been established definitively. It may well be a combination of reasons. I was always taught that leaf retention in winter was a sign of juvenility and in fact, it is the younger trees and the lower branches of mature trees that consistently hold onto their leaves. One theory holds that because these younger trees (and lower branches of older trees) are essentially growing in the shadows of the taller trees, they hold their leaves longer in the fall so they can take advantage of the increased sunlight they receive after the leaves of the mature overstory trees drop off. This allows them to continue to photosynthesize through much of the fall and thus produce more food for the tree. Because these leaves continue to function physiologically later into the fall, the abscission layer that normally forms between the leaf and the twig (causing the leaf to fall off) may not develop completely before the onset of freezing temperatures. 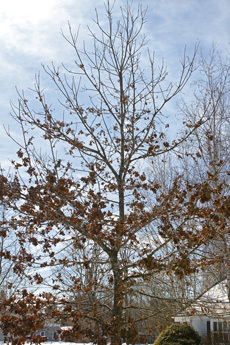 Therefore, the dead leaves persist on the trees until the swelling buds in spring pop them off. Another theory related to juvenility is that the leaves of these young trees are retained over winter to provide the tree with a nutrient source in the spring when the leaves eventually drop off. According to this theory, leaves that drop in the fall breakdown and release nutrients which may leach out of the ground before the following growing season. I don’t like this theory as well because leaves (especially whole leaves) don’t breakdown very quickly; it can take 6 months or longer for most leaves. This, combined with the fact that the leaves of oak and beech trees (trees that most commonly show marcescence) are some of the slowest to breakdown, makes me question this idea. 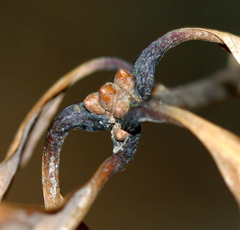 Still another hypothesis is that these withered, tough, dry leaves provide protection for the young buds beneath them. Protection from what, you ask? protection for the new buds. Marcescent leaves may provide the dormant buds protection from bitter winds and cold temperatures of winter or a more popular idea is that they protect the nutritious young buds from hungry herbivores like deer and moose. The dry leaves may be unpalatable enough to deter these large browsers from chewing off the tips of lower branches. Perhaps that’s why it’s the lower branches and younger trees that most commonly exhibit marcescence! I wish my fruit trees had marcescent leaves to protect their buds. Walking through our orchard last weekend, I noticed a lot of deer browse especially on the apple trees. Bummer! My favorite explanation of all comes from a beautiful story, perhaps from Native American lore. You can read it for yourself. I think it’s the best! 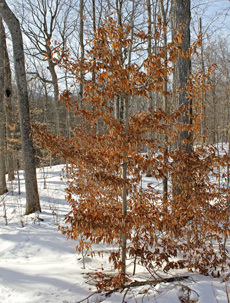 Regardless of WHY these leaves persist on the trees, I for one enjoy seeing them throughout the woods in winter – especially the light tan leaves of the young beech trees. 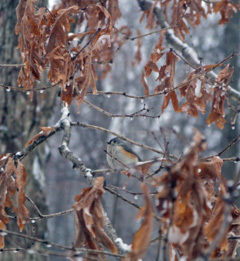 They really brighten up the winter landscape and their rustling breaks the stillness of the woods. The birds enjoy them, too. It provides them with shelter from the winter winds and gives them a place to hide while they peck at sunflower seeds from our feeders! Special thanks to Scott Welsh for the 2 Vermont photos!